Funny how things happen. At 10am I took a walk down the road from the hostel where I spent last night. On that walk, I discovered Bagelmen’s and wrote about it here. At 11am, I checked out of the hostel because I felt the manager’s behavior toward me became uncomfortable for me after I told him I was robbed at one of its owner’s other hostels and I didn’t feel at home there. I was told, I needed to leave exactly at checkout time. No problem. 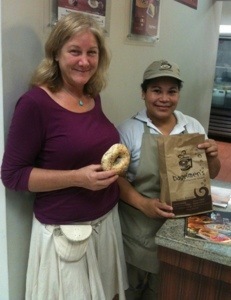 I had been welcomed at Bagelmen’s so I went there and relaxed while I looked online for a new hostel. I found a hostel that had excellent reviews and sounded perfect for me, called, and found my way there (in Spanish via two buses). Feeling at home, relaxed, happy and excited about my new albeit short-term home, I asked my friend of what is now 4 days to come for a walk with me around my new neighborhood. 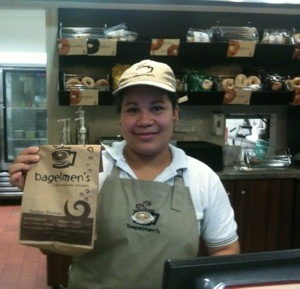 We very quickly came upon another Bagelmen’s. “Oh!” I said, “They have for for one at 8. Is it 8 yet?” (Truth be told I said that in Spanglish, which I often do now.) It was 8. Here is the beautiful woman who was so accepting of conversing in Spanish and repeated in English for me when I asked her repeat the price to be sure I grasped the number (475; I still have problems with triple digits). And here I am joining her to display my for-tomorrow “Todo” (Everything) bagel. The other one was nearly demolished by this time.